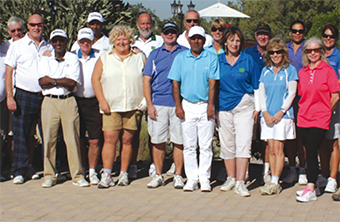 Club member Mohammed Al Sayed enjoyed wins in both the men’s gross and nett divisions of the Royal Golf Club’s first Order or Merit competition of the year with a gross score of 74 and a nett score of 70. Barry Hobday was runner-up in both categories with scores of 76 gross and nett 71 on countback. Former lady captain Hanne Hansen achieved the same feat in the ladies divisions, winning the gross section with a score of 88 and the nett section with 75. 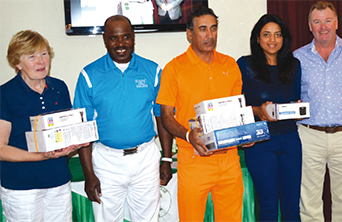 More than 80 golfers competed in the monthly members’ event. Results: Gents Gross – 1st Mohamed Al Sayed (74), 2nd Barry Hobday (76), 3rd Rob Lane (77). Gents Nett: 1st Mohamed Al Sayed (70), 2nd Barry Hobday (71 c/b), 3rd David Wales (71). Ladies Gross: 1st Hanne Hansen (88), 2nd Danielle Sheppard (96), 3rd Debbie Lane (98). Ladies Nett: 1st Hanne Hansen (75), 2nd Dagfrid Berge (78), 3rd Debbie Lane (80). Juniors Nett: 1st Saud Al Sharif (74), 2nd Stewart Hutchinson (80). 2s Club: Rob Lane.